Enchanting smiles and infectious laughter! Greek Lifeguards – equipped with a dinghy and engine, a jet ski, a defibrillator, and lots of skills and energy. Resourcefulness is key: bins made from the rubber rings refugees wear. Would these rings save your life? I doubt it. New tent from International Rescue Committee. Heated at night, it was much needed. Flooring to come soon? Greek coastguard tows a boat to safety. That same morning 14 people drowned. I don’t know if it was this rescue or a different one. One man who landed at the lighthouse beach. Thursday 12th November marked 3 full weeks here on Lesvos for me. I had intended to mark it with a special post and I didn’t get round to it for many reasons, the main one being that I have simply been too tired. With the tiredness comes an inability to decide what to write about and also an inability to express myself, so if I do find time to get online, I sit staring at the screen, not knowing where to start. Two days off were forced upon me when exhaustion caught up on Friday morning and I came down with fever. I am now feeling much better and will be ready to go again tomorrow. I can hear you all saying “Make sure you look after yourself”… Yes, I’m trying, everyone is trying but sometimes it is just too hard to put yourself first here. Do I not get up to drive the wet and cold families at 5.45am and 2am? No… I get up, because they need that and it makes one step of their journey easier for them. But I do then have to make sure I get a nap in the afternoon…if possible. Three weeks feels like a lifetime and a good point to stop and reflect. I will stay for another three weeks, so am looking at how I can best make the most of them and what I have learnt so far. Being here for what is a (very) long time in comparison to the vast majority of volunteers who will stay for a few days to a week, means that inevitably I suppose my role is changing or changed long ago. A few days here is not long enough to see the bigger, long-term picture and everything that is going on in the background, everything that needs to be done in order to keep going, in order to help the refugees to the best of our ability with the resources available. A few days is a good amount of time to work full power, helping people off boats, changing clothes, giving out food, driving people, etc. The energy and enthusiasm that these volunteers bring is the big advantage and it is so needed. Those of us who are here for longer need it and the refugees need it. But there are big disadvantages too… because they are here for such a short period, they want to get stuck in straight away, and so with no idea what they are doing, begin directing boats to dangerous places, doing things that put lives in danger or cause unnecessary panic and stress, to give just a couple of examples. The lack of understanding of the situation is sometimes coupled with an arrogance that they know best, and an unwillingness to listen to the people who do know. Deep breaths to be taken, and no comments or aggression to be taken personally. It is deeply frustrating as it needn’t be this way, and a lot of energy is lost. This is why at some point my role had to change. We have been stationed at one place now for well over a week and very positive and practical changes have taken place in that time. New tents have gone up, a seating area was created, rubbish bins fashioned out of rubber rings built. We even have a gas burner and huge pot dedicated to making hot tea. There is a team of Greek lifeguards posted there 24 hours a day – incredible! Now we don’t need to worry so much about the sea operations of getting people onto dry land. And of course, the tent is functioning and serving people well. But all this needs to be kept up, continued, and still more can be achieved – we need to make pictorial signs with instructions and explanations for the refugees. We need to figure out how to best handle the individual short term volunteers who turn up and make sure they know what to do and don’t create unnecessary chaos. We need to see if we can get shelving or clothes rails put up in the tent so that we can find the clothes and shoes we need faster and more easily. Flooring needs to be installed in the tents. And then we need to make sure that there is always a strong team of volunteers there to run the place, and that they do a handover to the next team of volunteers, to keep everything running. So this is how my role has changed! Thinking long term. Trying to make these changes now so I can move on from the lighthouse and explore other areas, but it may not be possible…we shall see. To give you a quick update about the van, I now have all the money needed for the rental thanks to all the very generous donors. Having the van is actually indispensable for what we are doing here. Every day we transport probably hundreds of people in it. I can also load it with supplies and in the boot there are always women’s clothes, children’s clothes, socks, plastic bags (put on dry socks, then plastic bags, then wet shoes can be used again), towels, blankets, hats, gloves, scarves and a huge bag of teddy bears. We were called out one night last week at 2am to pick up families from the beach and drive them to transit camp. Without the van they would have had to wait a long time in the cold. Because of the van, they didn’t. Two mornings ago at 5.45 we drove to help transport more people who had just arrived off a boat. I will never forget the grandmother who sat down in the road when she saw me coming, too tired to walk anymore, desperate to be picked up. I helped her into the van, she kissed my hands and face with gratitude and hugged me, thanking God. Her husband was wet from the waist down. He didn’t want to get in the van because he didn’t want to make the seats wet. I had to insist. Can you believe that after all he has been through and is about to go through, he still worried about getting the seats wet. Even once he was in the van, he still wanted to stand. We are deeply humbled every day. Struggling with slow internet so only a very quick post today! Sorry for lack of updates, I succumbed finally to a monster cold and took to my bed for 14 hours… before that though, I had the honour of driving many bus loads of beautiful Kurdish people. All with the same hope of finding a safe place to call home in a European country. Mostly Sweden. After a while, I have to stop asking the same questions because I get upset, wondering if they will find it. 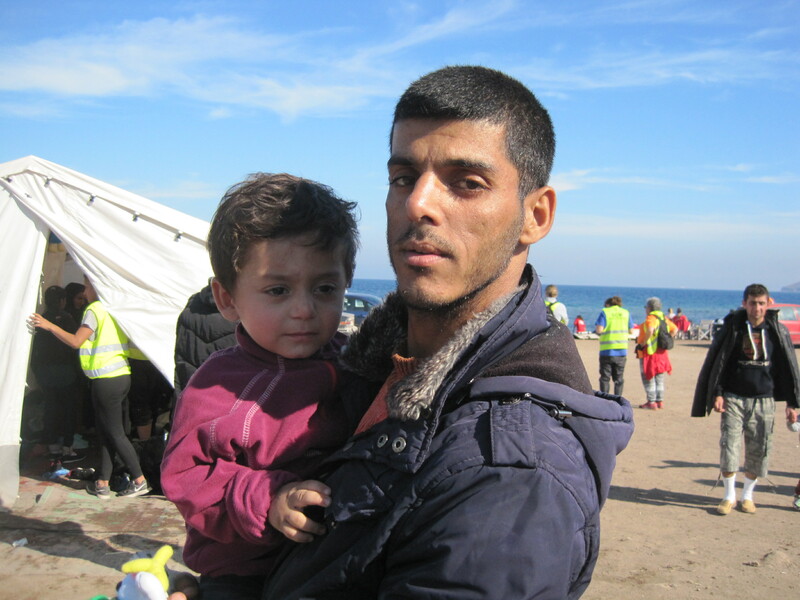 Here is Khalid, one of those many good people, who hopes to join family already in Europe. Am headed out now with a friend, a gas stove, a huge pot and some water to see if we can warm up some cold people with hot tea and a smile. The Human Faces Behind the Statistics: Miteb, Zuhoor, Hassan and Ateeyah. 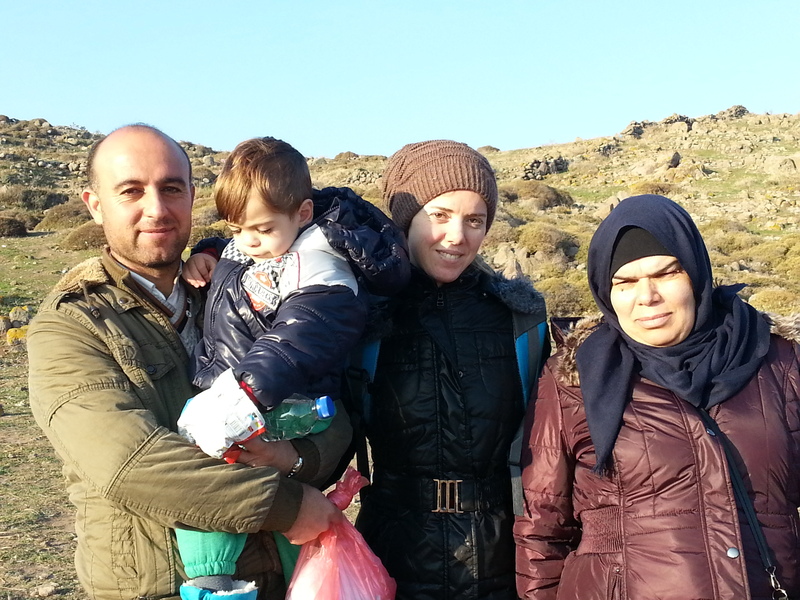 This beautiful family are from Syria. They left Damascus about a week ago. They arrived here two days ago. Wee Hassan is just two years old. His father is Miteb and his mother Zuhoor which means flower in Arabic. The women in the scarf is Ateeyah, Miteb’s sister. They are heading to Germany. If I receive updates on their journey I will post them. Two of the boats that have arrived in past few days. The old woman with the wheelchair came off one – can you imagine? Shoes strung up to dry and hopefully be reused. Road leading to Akti Hotel where I am staying. The Lighthouse beach is just behind. Once changed and ready the refugees walk or are driven (families and less abled) to the hotel, where they wait outside for the bus to Oxy. This bus, sponsored and run by the International Rescue Committee transports everyone to Oxy camp. Nikos, local hero with an enormous heart who is always on the lookout and almost always first on the scene. A quiet moment calls for much needed rest. Black rubber rings make great armchairs. As there is very little sense of time, days or dates here (only urgency and the present moment), I can only say that it has been for the past several days that myself and the rest of my team have been stationed at a post known as the Lighthouse. It is a small bay which is an easy landing place for boats, and it is just behind my hotel. There is a tent there (I suppose in a festive situation you might call it a marquee, but here it is very much a tent) which we run. We also look out for boats arriving in this area, assess where they might land and co-ordinate accordingly with other groups and locals. When stationed at the Lighthouse you are responsible for the stretch of the coastline from the Aphrodite Hotel, which is just next to my hotel, to Eftalou, a few kilometres further along in the other direction. Without fail, the day starts early. The first boats arrive at first light and the day before yesterday the bang on the door came at 6.30, the earliest start yet. Yesterday was more reasonable (smugglers, how about giving a little more thought to our sleep?!) and I managed to get to the tent before the first boat came in, sometime between 7.30 and 8.00. The tent is a rarity along these shores and is there all the time. Owned by NGO WAHA it was set up by them but the group I am working with, Norwegian NGO Drop in the Ocean, is responsible for the day-to-day running of it. How wet the people are when they land depends very much on the type of boat they make the crossing on and how they get off the boat. People arriving on the black rubber dinghies are generally very wet, especially the women and children as they are sat inside the boat and often end up sitting in water, whilst the men are sitting on the edge of the dinghy can be dryer. Those who cross on the metal or wooden boats that sit high out of the water are usually dry, provided they can get off the boat without getting in the water, which is much easier said than done, depending on where they land. The high hull of the boats means that they run aground metres before shore. In these cases if to hand, a dinghy is brought in to pass them onto and bring ashore. The tent, therefore, is essential to our work. It is a changing area, it is shelter from the wind, it is storage for clothing, it is a place for weak or sick people to lie down and rest. When we arrived on our first day there, it seemed a more than a little neglected and we set about cleaning it up and making it as functional as possible. A women’s changing area was rigged up in one corner with a couple of sheets and some clothes pegs. Someone brought along some big UNHCR mats for the floor. A table was sourced and set up for baby-changing. Most importantly, supplies were stocked up and organized carefully. Inside the tent you can expect to find at all times (if we’ve had time to stock up! ): clothing for babies, nappies, baby wipes and cream, towels, blankets, emergency thermal blankets, children’s clothing and socks, women’s clothing and socks, bottled water and an endless supply of plastic bags. If we can’t supply dry shoes (very difficult to do) we endeavour to get people dry socks. They can then wrap their feet in plastic bags and put their wet shoes back on. Works a treat and the shoes soon dry in the sun. Most of this is stored in huge black boxes, fashioned out of the salvaged rigid bottom of the black rubber dinghies by a local man. Whoever it is at the rudder, they are not usually familiar with the sea, let alone steering a boat, which makes for some interesting twists and turns, which is probably due too to the fact that there are so many people on board the man steering can’t see anything and must listen to all the others jumbled directions as they follow our signals from the shore! Anyway, the point is to get the boat as close into shore as possible without assistance, so signalling to the people to stay calm and to stay sitting, and to keep coming to us. We should not wade out into the sea, as they then cut the engine and need help to get in. We should only go in the sea if needed and always will once the boat is stopped. Children are carried off, everyone helped ashore and out of their lifejackets. It is generally quite chaotic even if we try to keep a calm atmosphere – the refugees are so relieved to have landed. We encourage them to leave their lifejackets in a pile and as best we can, direct the men to behind the tent where they can change and help the children (always with a family member, always letting the parents know) to the tent to begin changing their clothes. It can get very chaotic inside the tent, depending on the number of people, how wet they are, how scared they are and where they are from (Syrians very calm, Afghans and some Iraqis less so!). We try to keep things ordered and control the distribution of clothes where possible, for the main reason being that if we don’t a lot of clean clothes and shoes end up getting wet and dirty in the process and we also end up not being able to find anything which slows everything down. I am learning to accept chaos and let go of control. We are all learning to find a balance of firm and kind and this is the hardest part – the last thing we want to do when people are in shock and traumatised is to be strict but we have to. The hardest aspect of all of this is the language barriers. Everything is done in sign language if we can’t find an English speaker in the group (although about 50% of the time we can). Languages that pass through are mainly Farsi, Arabic and Kurdish. This is where we learn our random vocabulary: beeshee means sit down in Farsi, maee water in Arabic, jorob socks in Arabic or Farsi. Boussa or boussi in Farsi? Kiss! We must also hurry people on through the tent as there is often another boat following, so we need to get people moving to the next stage. This too is hard to do because we don’t want to, and because of the language barrier. But it must be done. A large bus is ordered to take them to Oxy camp. From the beach they need to walk ten minutes to my hotel, which is the bus stop for them. We drive families and disabled people, often directly to the camp if we have time. The van that you have all contributed to is used all the time for this purpose and without it we would be up the creek- two locals use their mini bus and pick-up too but it is not always enough and they have jobs and other commitments. Yesterday an old Syrian woman in a wheelchair came off a boat. She was a large heavy woman and very weak, and how they got her off, I don’t know, I was busy changing children in the tent. When I think of what she has endured to get her I feel deep anger and shame. She was a woman of great dignity who has lived a long life with her family and is travelling with them now, in a wheelchair, across Europe, to a strange land that will never be home for her, no matter how safe. She had lost her headscarf. I managed to find her a beautiful pink one that would be warm too, which restored some dignity for her but she was clearly suffering a great deal. Her and her family would most likely have spent the night in woods in Turkey, where they are forced by the smugglers to wait to board the boat. There they would have slept outside with no food or water and most likely no idea of how long they would be waiting. Then there was the boat journey for her. Then she was sitting on the shore, her family nearby, clearly disorientated. She was helped into the van and we drove straight to Oxy where I found an Arabic speaking doctor from La Chaine D’espoir, a French NGO. I left them there knowing that there was nothing more I could do for her and wondering what the next stage of the journey would be like- more time spent sleeping outside? Would she be able to use a toilet anywhere if needed? Would she be a priority along the way? How will they get to their final destination – they can’t push her all the way in a wheelchair? The rest of yesterday was calm. The tent was cleaned up, organised and restocked. I stocked up the back of the van with teddy bears, blankets, towels, socks, and women and children’s clothes in case we have to go to a boat that doesn’t arrive at the tent. I tried to take some time out, but wondered all the time if I was needed somewhere, if the van was needed, if my team needed help. I went back down to the Lighthouse around 8 to be told that men had been seen walking on the road and could I come and drive them to Oxy. We found them on the road and they jumped into the van quickly. A group of Syrian men whose boat had come ashore nearby and were soaking wet. They had sent the women and children on ahead to the camp. They spoke excellent English and thanked us profusely for the lift. They were so humble, so polite, so grateful. We would have liked to stay chatting with them and get their stories but they told us two more boats were on the way and we thought it best to get moving. The boats came in late at night, I was sleeping. It is 7.30am here now and boats will no doubt be arriving so it is time to get going. Photos of camp to follow. A new update will have to wait for tomorrow folks… I was on my way to get Wi-Fi and write when I was called down to the shore for our last boat arrival of the day at 20.30. So you can watch this video of some of the gorgeous children who arrived on our first very early boat this morning (6.30am!). It goes like this: identify wet babies and children (they were sopping), get wet clothes off, dry child, wrap child in warm blanket, try to find them clothes that fit. If they’re really cold, pop them in the van with the heating on. Then make them smile! Beautiful, smiling Mustafa. His mum was not doing well when they got off the boat yesterday morning. She was very upset and panicked and crying uncontrollably. We laid her down in the tent and sat with her for a long time. We found her three gorgeous children and took them to her. Her husband too was crying a lot. The children were visibly perturbed by their mum’s breakdown but stayed calm. When everyone was feeling better I drove the family and the other two families they were travelling with to Oxi camp. The tears had stopped and everyone was smiling, especially Mustafa, as he got to sit in the driver’s seat and toot the horn.